I point to a no-nothing night. the way it reflects two lives. In one, home is a disappearing landscape. I call out to the no-nothing & my words turn to gold smoke. in a pantry my small hands could not reach. To keep me as American as possible. Or safe. skinny with a language that was second-handed to me. the house on Danville St.
the sound of god falling out of my mother’s hands. & I think this is home. I.S. Jones is a writer, educator, and hip-hop head hailing from Southern California. 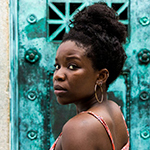 She is a fellow with The Watering Hole, BOAAT Writer’s Retreat, and Callaloo. I.S. is very Blk & loud about her joy. In 2016, she was nominated for a Pushcart Prize. She has been praised by Rachel McKibbens as a “god-lit marvel”. She is the Assistant Editor at Chaparral. Her works have appeared in The Harpoon Review, The Blueshift Journal, SunDog Lit, MatadorReview, Wusgood.black, forthcoming in great weather for MEDIA, the Black Voices Series with Puerto Del Sol, and elsewhere. She received her MFA from Hofstra University.